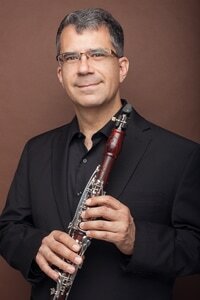 Jerome Simas holds the positions of bass clarinet/utility clarinet with the San Francisco Symphony and principal clarinet with the California Symphony. He has performed with other orchestras including the Cleveland Orchestra, San Francisco Opera (as acting principal), Sun Valley Summer Symphony, Chautauqua Symphony Orchestra, and Naples Philharmonic. He was a fellow at the New World Symphony - with which he recorded Gershwin’s Rhapsody In Blue and Stravinsky’s Ebony Concerto for BMG Classics– and has held principal positions with orchestras such as the Oakland Symphony, IRIS Orchestra, Modesto Symphony, and Akron Symphony. As a chamber musician, he studied and performed at Marlboro Music in Vermont and is currently solo clarinetist with the Left Coast Chamber Ensemble, a San Francisco-based group that presents newly commissioned works alongside traditional masterworks. He won Grand Prize at the Fischoff National Chamber Music Competition and First Prize at the International Clarinet Association’s Young Artist Competition. He has appeared as soloist with many orchestras including the California Symphony, Monterey Symphony, Green Bay Symphony, and IRIS Orchestra. As a music educator, he has taught master classes in the US, Canada, and China and is a member of the collegiate faculty at the San Francisco Conservatory of Music. He is currently a coach with the San Francisco Symphony Youth Orchestra and also enjoys mentoring adult amateur musicians and coaching adult community ensembles throughout the Bay Area. He previously taught clarinet at the University of Oregon School of Music and Dance, Stanford University, University of California at Davis, and the University of Akron. He received his BM and MM degrees from the Cleveland Institute of Music as a student of Cleveland Orchestra principal clarinetist, Franklin Cohen.